The MacBook Air 2012 is a screamer, and though the CPU-based benchmarks show about a 15-20% improvement over the MacBook Air 2011 models, by far the biggest performance boost comes from the new flash memory (SSD) that Apple is using for storage on the 2012 models. 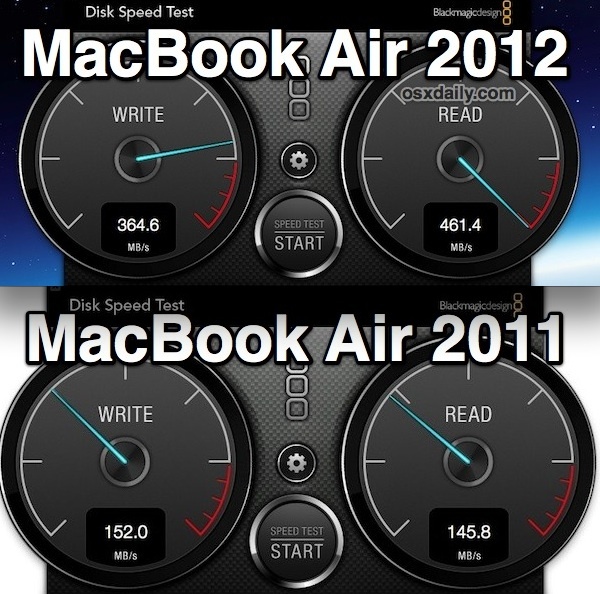 In our tests, the disk used in the newest MacBook Air models is up to 217% faster than the previous model years drives. It is difficult to convey just how fast the newest MacBook Air is, but it’s safe to say the performance is extremely impressive and I haven’t ever used a laptop that feels faster. You can attribute that to the ultraquick flash storage. Interestingly, the SSD tested within the MBA 2012 is the TS128E model, a Toshiba drive. The SSD tested with the MBA 2011 and 2010 models are Samsung. You may recall that Apple also ships faster Samsung drives in some MacBook Airs, that appears to still be going on with the 2012 updates which suggests the tested Toshiba flash drive is probably slightly slower than a Samsung model, though the performance difference between the two drives is likely to be completely negligible at this point. All read and write speeds were benchmarked with DiskSpeedTest, a free disk testing app available from the Mac App Store. The processor is 15-20% faster as well, where did you get the idea it’s slower? The processor is faster than previous Airs but I thought they were significantly slower than those in iMacs and MacBook Pros ? What do you expect? With the MacBook Air, you’re trading in high performance for portability. Of course they’re not going to be as fast an iMac or MacBook Pro. Shouldn’t call it slow. With the CPUs these days, opening say, “Pages”, its probably the MacBook Air that is going to be faster, or if it had a HDD, at least equal in speed. But say, rendering a video, the MacBook Pro is going to get more work done in the same amount of time, because it has 2 more cores to do the work. Speeds of single thread tasks does’t get affected by CPU stats (not much), really its the performance (Horsepower) that is changed. How come my 2012 Air gets ~260MB/s write & ~440MB/s read? What should I do? Did you let the full test run or just the first tests in DiskTest? 260/440 is extremely fast, I wouldn’t worry about it. You can check the manufacturer of your SSD by going to  -> About This Mac > More Info > System Report -> Serial-ATA, it will say something like “APPLE SSD TS128E” or “APPLE SSD SM128” etc. 260/440 is not extremely fast, seriously! My zenbook (1st gen, sandy bridge), it had about 375write/500read with the slower Sandisk. If you are luck to have ADATA, it can run about 420+/550. As apple said, they will put the new series of SSD can read close to 500MB/s on the models of 2012, but the fact is not that close. I saw other folks doing the speed test around the internet, overall the reading speed test results are within 420-460MB/s, never see any more close to 500MB/s. Looking for the faster SSD on the Air, is the only reason getting me to buy, however, it is pretty disappointed. I am not talking about the CPU, not talking the keyboard, not else. Just talking about the SSD. P.S. I do agree the Macbook Air is a great machine, but the SSD is still running slow by today’s standard (Mid-2012), comparing the most up-to-day SSDs. I’m getting 405.0 MB/s write and 442.4 MB/s read on my 2012 13″ MBA i7-2.0, 256GB SSD, 8GB RAM. SSD is “APPLE SSD SM256E”. I’m getting very similar numbers on the same computer with an i5 processor. Between 390 and 400 write and 450ish read. Oh, and mine is the same SM256E hard drive. Well, honestly, just because your specs are a tad lower than the pictured one doesn’t heed worrying. Seriously? you’re going to complain about 60MB/s throughput as compared to the previous generation MBA’s SSD? I say return it explaining that the SSD is too slow then they claimed it is supposed to do; despite the fact that the claim is vague with an “up to” statement. Hell forget that, just donate it to someone who’ll appreciate the device more who cares less about the bandwidth numbers, so long as it performs substantially better then the previous generation MBA! You asked what you should so?Well, you can opt to do what every other whiner does, sue Apple. Because apparently they haven’t fulfilled what they claimed. There is no indication of whom at Apple that quote was from. The WWDC Keynote even fails to state any bandwidth numbers, save for the Promise TB drive. So, to state that “Looking for the faster SSD on the Air, is the only reason getting me to buy” effectively basing it on unsubstantiated claims by Apple is frivolous. Sorry to sound like an A-hols, but why can’t people stop whining about sh!t?!? It’s so much better then the previous gen MBA as Apple has advertised. Just want to show, how I got the information directly from APPLE. I stand corrected and apologize. I still think it’s rather frivolous to nitpick. Personally, I’d still be happy with 460MB/s reads. Why pay for a premium device to get a sub premium experience. If your new BMW was 15% slower than everyone else’s I’m pretty sure you would be pissed. He’s right to be annoyed. Not bad! You must have the Samsung SSD, which is quite a bit faster than the Toshiba. I got a similar result. Using the MacBook Air 2011 13″ with SM256C I got 262.1 R / 260 W.
Wow, compare that to my MBP I7 2010 – Read 56MB/s and Write 64MB/s. Don’t know if thats normal for non-flash storage or not. Can’t wait to see the speeds on the Retina MBP! That’s nice but it’s definitely not impressive compared to other ssds out there. Darn, my early 2011 Macbook Pro with 500GB SSD came with a Toshiba “APPLE SSD TS512C”. Always seemed fast to me, but apparently it is relatively slow: 130MB/s writes, 190MB/s reads (on Lion, didn’t measure under SL). I bought AppleCare, I wonder if there’s any way to get them to swap in the 2x faster 2012 SSD drive. For a comparison, a Firewire 800 1TB WD My Passport Studio drive (5400 RPM) I just got gets 69MB/s Write and 70MB/s Read. A Macbook Pro 15″ Retina with a “APPLE SSD SM512E” is getting about 390MB/s Write and 390MB/s Reads. I let the Speed Test ran a couple of times (around 20), I thought it would turn off by itself. At first I got speed at around 360/460, but now I only get 160/380! Have I ruined my SSD, which is a Toshiba btw? no, it’s just averaging your write speeds. My 2011 Macbook Air reads and writes at around 250MBs. I am running the exact same software as these tests. Anyone have any ideas as to why this is? A request.. Anyone with a 13 inch 2012 Ivy bridge MBA with Toshiba SSD, can you please post your read/write speeds… I’m planning to purchase the base model but all the 13 inch base MBA’s I’ve checked at the apple stores have a Toshiba SSD.. Thanks in anticipation!! The drive shown in the screenshot of this article is a Toshiba, they are very fast. Can anyone tell me whether they have some sort of daemon workaround for the situation when the whole disc gets full and you need to write over a previously written area? You all know (i suppose) the major SSD flaw is that you will be enjoying that speed only until the last byte of that SSD has been written to, after which time major slowdowns will occur. Dig into it to find out more and for those of you who have SSD macs for over a year and using the file system extensively please share with the rest of us a benchmark result. If let’s say the read / write speeds drop in half, that’s still better then any HDD, but from what I read, the speed drops to about a mid range HDD. Now most of these tests were either performed on winblows or Linux, where I’m pretty sure no one had the time (to market) to supply a workaround(kernel patch/daemon/windows special driver). However, I think Apple might have addressed this issue in the OS (perhaps with a kernel module to optimize/wipe data preemptively or something), seen as how much more attention they pay to details, in which case I could enjoy this speed all the time. I need to buy a mac and I’m thinking Air especially for SSD speed, if and only if this speed does not drop too much in time. I’ve had a MacBook Air since 2010 with an SSD, hasn’t slowed down at all. Yes they degrade over time, but if you plan to upgrade the machine every 3-5 years you will probably never notice the speed drop. After all, no matter what CPU you have, if you don’t plan on simulating out galaxy particle by particle or to transcode full HD movies or something, the Air CPU is more then enough. I’m a developer working with lots of CPU intensive stuff and I can tell you the hard drive is the bottleneck, while the CPU is idling most of the time. PS: For those of you thinking that the standard SSD might too small, there are firms out there that will sell you a disk (made especially to fit in the MacBook Air) and the screwdrivers needed to change it. Not sure if they work on the 2012 version but if you’re out of warranty why not? I’ve seen the videos and there’s nothing to break in the process. Some brands also claim even faster speeds, for the 2011 Air at least. Any of you replaced the stock disk with one of those?